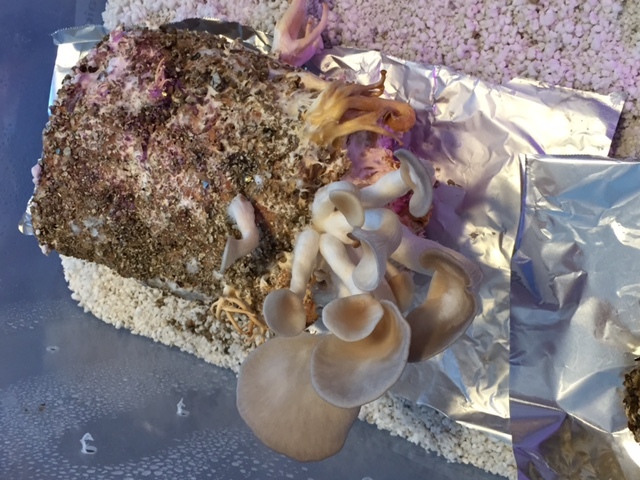 We will be selling oyster mushroom kits at the Medicine Hat Farmer’s Market on Saturdays. Along with shiitake, oyster mushrooms are renowned for their use in stir fry and other Asian cuisine. Our mushroom kits are grown on brown rice flour, and have been sterilized under steam pressure for 90 minutes. 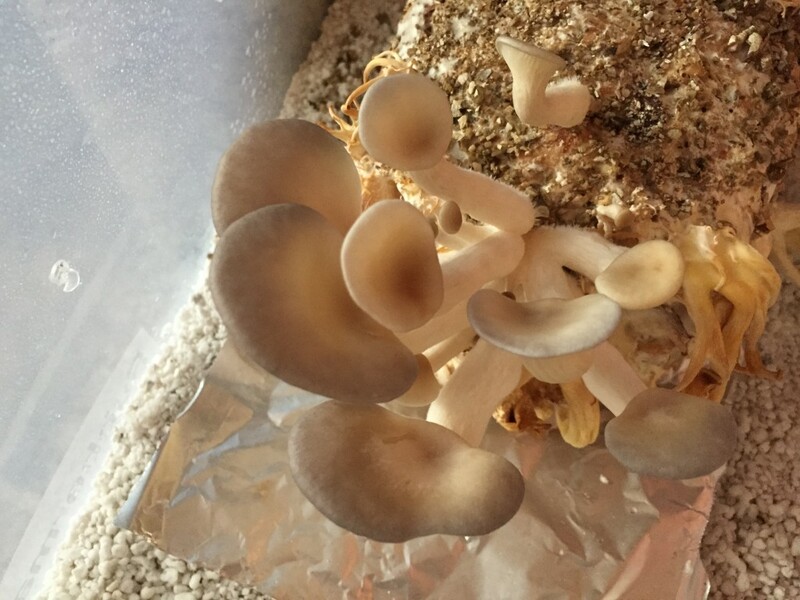 Once you have taken your mushroom kit home, simply remove the vermiculate-wrapped mycelium from its jar, and soak in water overnight in covered container. After soaking, place into a clean plastic bag. Allow for one end to be opened slightly (3 x 3 inches; 7.5 x 7.5 cm) to allow for air exchange. 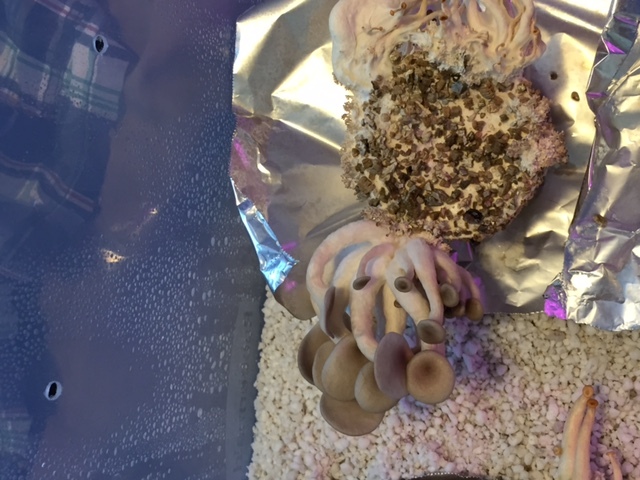 Moisten the mycelium, growing caps, and inside of the bag with a spray bottle 4-6 times per day, so that the sprouting mushrooms do not dry out. 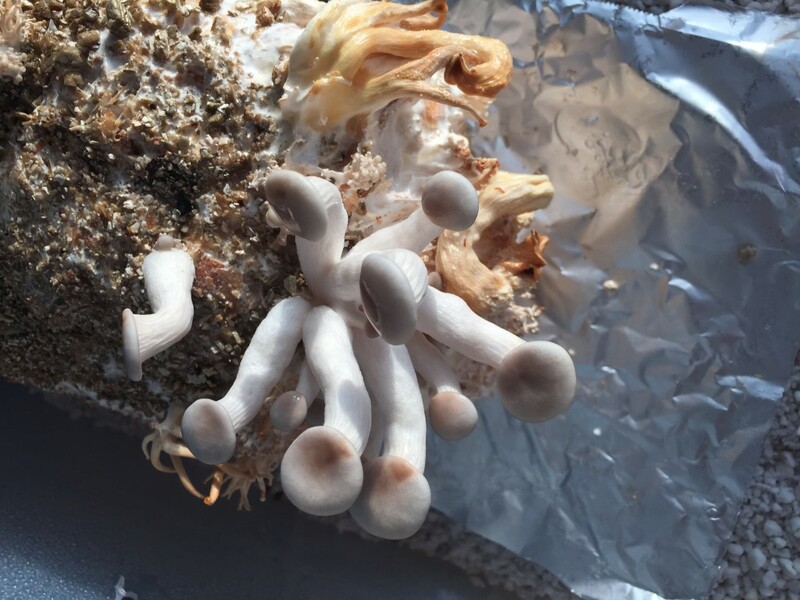 Maintaining high humidity is the key to making mushrooms fruit quickly. Store the bag in indirect sunlight between 60 and 75 degrees F (16-24 degrees C), and within a few days mushrooms will begin to form. Cut and collect mushrooms when they are fully formed (see pictures below), wash well, and use as soon as possible. Your mushroom kit may produce four or five flushes of mushrooms, with each flush producing less than the one previous. Once they are finished—toss into the compost bin! 1. Soak in water overnight in a covered container. 2. Place inside a clean plastic bag with one end opened slightly. 3. Spray growing mushrooms 4-6 times per day to maintain high humidity. 4. Store in indirect sunlight, between 16 and 24 degrees C.
5. Cut, wash, and cook. 6. Repeat until no further flushes are produced.